Libertarian Senate candidate and current New Mexico land commissioner Aubrey Dunn dropped out of the New Mexico Senate race, citing that he needed to focus on his current office. “After much contemplation with my family and supporters, I believe I need to focus on my job as Land Commissioner for the remainder of my term,” Dunn said in a written statement to multiple New Mexican news outlets. Dunn was one of the first people to like the Gary Johnson for Senate Facebook page, according to the creator of the page, Charles Peralo. “He was the ninth guy who liked my Gary For Senate page,” Peralo told The Daily Caller News Foundation. While Johnson might still be considering a run for Senate, multiple former Johnson staffers who worked for him on the 2016 presidential election have spread the word that Johnson is running. Daniel Fishman, who was Johnson’s northeast regional director and is the current Libertarian candidate for state auditor in Massachusetts, wrote in a Saturday post that it was “official” that Johnson is running for Senate. 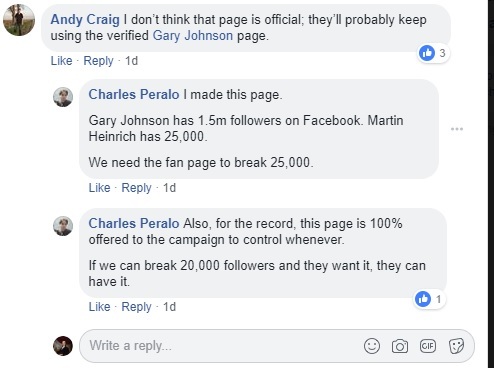 Andy Craig, the Endorsements Director for the Johnson campaign in 2016, said the announcement would likely come on Johnson’s official Facebook page in a comment on Fishman’s post. Johnson received 9 percent of the vote in New Mexico in the 2016 presidential election, while garnering 3 percent nationally. If he were to run, he would have name recognition and a solid fundraising base. Johnson raised more than $13 million in 2016, according to Open Secrets, raising more than Green Party presidential nominee Jill Stein and independent candidate Evan McMullin. “Two years ago we shouted, ‘We can win.’ Today we are shouting, ‘We will win,'” Peralo said. The New Mexico Libertarian Executive Committee would have to nominate Johnson to replace Dunn on the ballot, according to the New Mexico Political Report. That meeting will be sometime in August. Nielson also said there was a lot of interest and excitement for a possible Johnson Senate run in New Mexico. If he runs, Johnson would be running against incumbent Democratic Sen. Martin Heinrich and Republican Mick Rich.